2012 Was A Great Year of Fishing! 2012 Year in Review Coming Soon! 2012 was an incredible year for Speckled Sea Trout in the shallows of the eastern shore Islands of Chesapeake Bay. 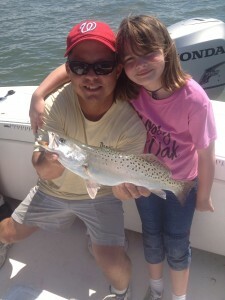 From late April through October Speckled Sea Trout were available and abundant when properly attacked! More to come……..